I'd like to start today's post by saying thank you, to our Veterans for your service! And, thank you to the families of our Veterans for all you have sacrificed. This past weekend, I had an amazing experience hosting over 200 kids at The Home Depot in Grand Rapids, Michigan as part of the fifth annual Celebration of Service. 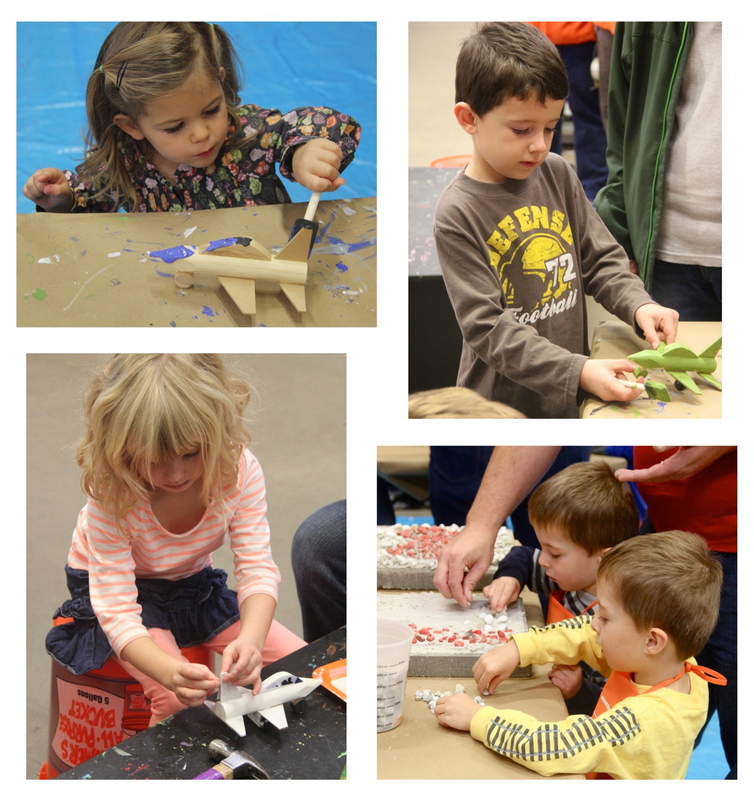 In honor of Veterans Day, this month's Kids Workshop was dedicated to making wooden jet airplanes. 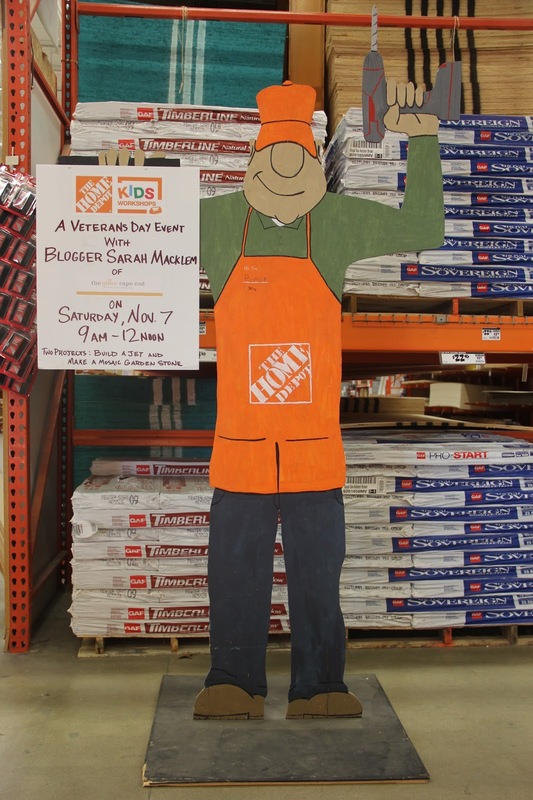 In addition to the jet planes, our workshop was one of only three stores across the country where the kids made a very special custom project for a local charity that assists our veterans. Every month in Grand Rapids, Michigan the kids workshop is a big hit. This one, however, seemed to be extra special and drew an extra large crowd. The store employees were prepared for lots of kids and they were not disappointed. I arrived at 8:00 am to find project tables lined up down the main aisle as far as the eye could see, just waiting for a crowd of little Do-It-Yourselfers to arrive. It didn't take long for the store to fill, and then overfill, with little ones eager to try their hand at these special DIY projects. It was more than just a workshop for kids, it was a workshop for families. Moms, Dads, Grandparents, Aunts and Uncles all showed up and joined in the fun. Thanking our veterans and talking about the importance of doing so to the kids was the topic of discussion throughout the workshop. My favorite part of the day was working alongside the children and hearing their stories about friends and family that have served our country. For some of the kids, this was the first time they attended a workshop and made their own DIY project. But, many of them were DIY pros and the workshop is something they look forward to every month. The jet airplane project was a big hit, of course. The kids were playing with them before the paint was dry and couldn't wait to take them home. The mosaic garden stone project was a great way for the kids to express their creativity and create something special to give as opposed to keep. 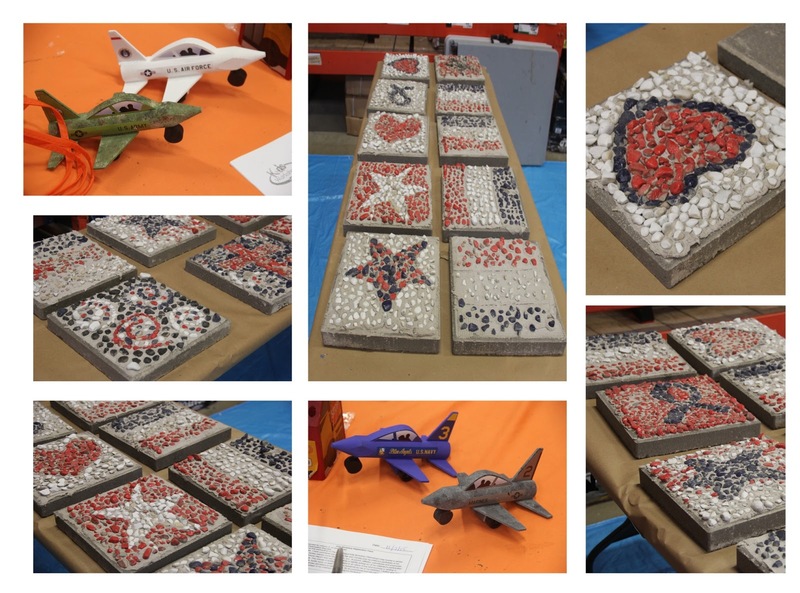 In the end, we made over 18 patriotic garden stones. Most of them will be given to Habitat For Humanity, in Kent County, Michigan for use in their Learning Garden. The Learning Garden is a place for new homeowners to learn about caring for their lawn, gardening, and landscape maintenance. A few of the stones will be going to the homes of local veterans that are currently receiving home improvement assistance from Habitat For Humanity. For step by step instructions on how to make these DIY Mosaic Garden Stones, please click here. It is a fantastic project for kids, especially for the upcoming gift giving season. The children that attended the workshop really enjoyed the project. 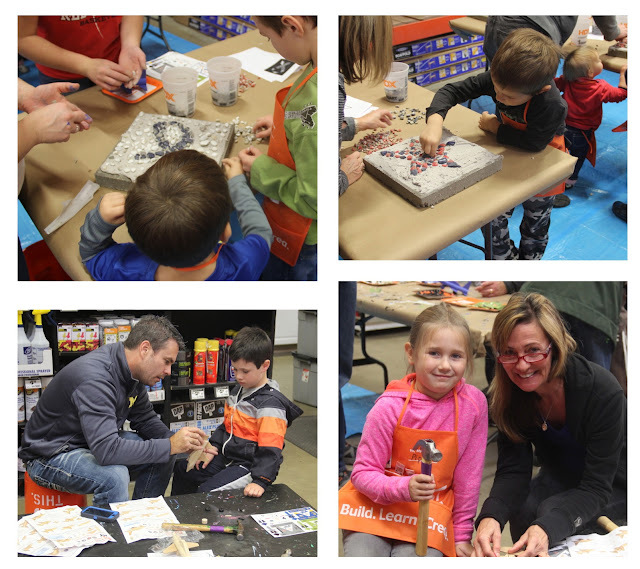 For information on the monthly Kids Workshop held by The Home Depot at all store locations each month, please click here. 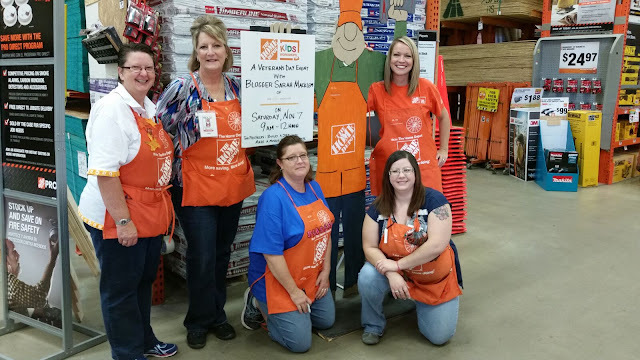 To learn more about The Home Depot Foundation, Team Depot, The Celebration of Service Events held across the country and how you can help, please click here. Thank you, Home Depot Store #2720 in Walker Michigan (Grand Rapids) for having me! I enjoyed co-hosting this workshop with you more than I can say. And a very special thank you to all the families that came out the workshop and made it such a huge success.